Instagram influencer Colleen Grady is being slammed for being "racist" after she expressed surprise that someone in “the poorest most overcrowded country” would return her lost iPhone X. ‘MindBodyColleen’ visited Jaipur, recently and in a series of events she lost her ‘expensive’ iPhone X. 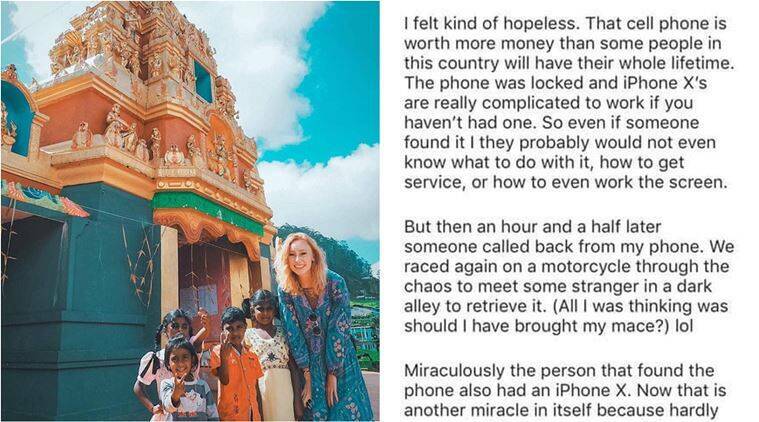 An American yoga instructor and travel blogger riled many online after she implied, in a recent post on Instagram, that Indians are too poor to buy an iPhone. Instagram influencer Colleen Grady was slammed for being “racist” after she expressed surprise that someone in “the poorest most overcrowded country” would return her lost iPhone X. The blogger from Indianapolis, Indiana, shared her ordeal of how she lost her “sleek, expensive, 5-month-old iPhone X” on the streets of Jaipur. “Yep, I lost it in the poorest most overcrowded country I have ever visited and one of the most scammy tourist cities in all of India,” she wrote, adding th at she didn’t expect to get it back since the phone was “worth more money than some people in this country will have in their whole lifetime”. Anyone who finds it “probably would not even know what to do with it,” she said. However, later the same day, she received a call from a local who informed her that her phone was found. “But then an hour and a half later someone called back from my phone. We raced again on a motorcycle through the chaos to meet some stranger in a dark alley to retrieve it. (All I was thinking was should I have brought my mace?) lol,” she joked. After the post garnered attention — and hate — online, Grady not only deleted it but also her account. However, screenshots of the post are viral on Facebook and Twitter. Users have ttargeted her for her ignorance and threatened to boycott brands if they do not stop working with Grady. ‘Mindbodycolleen’ – her mind is so impure that any amount of yoga won’t help cure anything. She deserves to be in an asylum. Why is this MindBodyColleen even allowed to make a living off Yoga when she thinks India is such a poor dirty country and that Indians can’t afford anything and have no brains? Why? I’m a brown person currently working an iPhone X to type this message. If I met Colleen in real life it would shock her so much that she’d stand up the normal way. I love how she talks about the local Indians at being so technically illiterate that they can’t use an iPhone. INDIA REACHED MARS WITH LESS MONEY THAN IT COST TO FILM ‘GRAVITY’!!! Somebody returned the damn thing (she did not just find it) and she still has the gall to talk nastily about the people.. “scammy, poor, overcrowded”.. Wow. “worth more than they’d make in a lifetime” how can somebody be so.. desensitized and horrible? Do you realize @mindbodycolleen just posted an epic racist tirade concerning a country who’s culture she profits off of appropriating? Doesn’t make me want to try your product. With the continued attack, she even shut down her travel website. On the front page, however, stands just an apology which too didn’t leave anyone impressed. Grady has issued an apology for the post. “I am sorry that my words did not give clarity to the intentions in sharing my story. I had no intentions to belittle the Indian culture. The moral of the story was the blessings and gratitude I had for the Indian people who helped me in a moment of panic when losing my phone in a foreign country. I apologize the most for the amount of pure hate that this has pulled out of so many people’s hearts and spread around the world. “Ask yourself — If you found a smart phone device on the street locked, out of service, broken, no buttons, and the software is not in your native language: would it be easy for you to find the owner and return it? For me, the answer is no. I think most of us would agree the answer is no. This has nothing to do with race, ethnicity, class, education, etc.” she said in defence.